Bryan Ivie could not make his varsity team at Manhattan Beach’s Mira Costa HS until his senior year, but then his volleyball career took off. He went to USC where he led the Trojans to NCAA titles in 1988 & 1990, and a runner-up finish in 1991. He was NCAA MVP for the 1990 team and the first USC player to ever be named College Player of the Year twice. He started his college career as the ‘Volleyball Monthly’ Freshman of the Year and ended as a 3-time college All-American. He finished as the all-time USC leader in kills and blocks. A strong international career was next. The 6-7 Ivie played on two USA Olympic Teams. This included winning a bronze medal at the 1992 Barcelona Games (he had 23 kills in the medal match) and then being nominated for the Sullivan Award as the best USA amateur athlete. He also started in the 1996 Atlanta Olympics. He was the USA Team MVP in 92, 93, and 95 and became team captain in 1993. He also led the 1994 USA World League team in kills and blocks, plus playing on one US Open title team. During his international career he was part of squads that won 3 silver and 4 bronze medals. 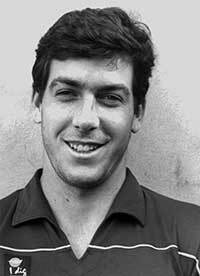 He was a member of the USAV 75th Anniversary Team (1978-2003) and was named to the Pac-12 All-Century team.